Maryport & Carlisle Rly coach, Brownhills West, Chasewater Rly, Sat 15 December 2012 1. Six-wheel full third, originally M & C No 11, built by Birmingham Railway Carriage & Wagon Co in 1875. Sold by the LMS in 1930s and finished up in miners' trains at Cannock & Rugeley Collieries, hence its presence at Chasewater. The coach has its original frame and wheels. 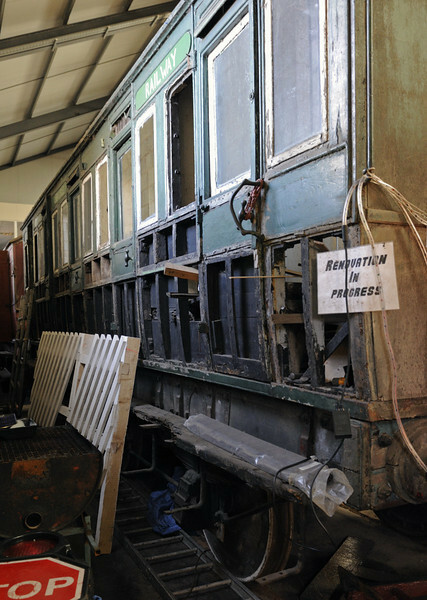 It was restored for the 1975 Shildon cavalcade, but subsequent outside storage means it now needs restoring again. It is the only coach to survive from the minor railways of Cumbria.